Some of us in the population are just doomed to spend the rest of our lives freezing. We are cold during the winter months no matter how many layers and coats we bundle in, and we are cold during the summer months when our coworkers freeze us out with air conditioning. People ask us why we carry around jackets with us wherever we go and the answer is simply, we’re freezing! In this review, you can see some of the best infrared heaters you can get to keep yourself warm and cozy during all times of the year. This space heater alone has some of the best reviews you can find on Amazon. People who have purchased and used this product have wholeheartedly loved it and cannot find anything they dislike about it. The brand name Dr. Heater may not be the most well-known brand, but it is labeled as the world best, safest and quietest infrared heater. Before we go into the product itself, let’s go over a little bit about infrared heaters. Infrared heaters create heat that can be best compared to the feeling of sunlight. The infrared light that is emitted from the heaters is not visible because it is far beyond the spectrum that the human vision can see. This invisible light is constantly absorbed by our skin, clothes and many other objects, which is how things tend to warm up around this machine. Compared to other units, infrared heaters will gently increase the temperature of the heaters surroundings. This is what makes them ideal for your home and office. One of the main benefit about infrared heaters is that they work instantly, and tend to be gentle and silent. Overall they are known for being cost-effective and environmentally friendly, as well as requiring minimal maintenance. Since they heat the objects in the room as opposed to the air in the room, you will immediately feel toasty and warm when you turn this on. While these features are generally universal qualities of all infrared heaters, each one comes in a different shape and size, as well as with a variety of qualities that make them unique. This is the reason why this review is here to help you sort them all out. The first heater on our list is the Dr. Heater brand. 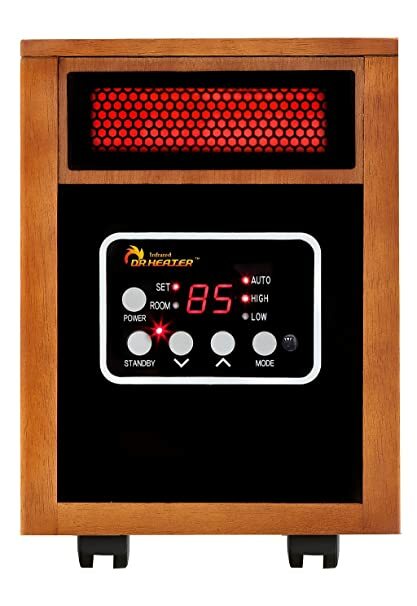 Dr. Heater is a top rated brand that has thousands of satisfied customers worldwide. This brand boasts that it is the #1 best-selling heater online, and has over 98% customer satisfaction. With 60% more heat and approximately $400 in average energy savings, it’s hard to imagine who wouldn’t be satisfied with this product. 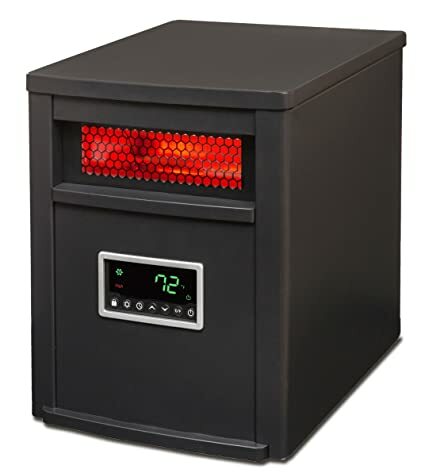 This specific infrared heater is newly engineered and designed in the USA with an advanced dual heating system. Since it has a dual system, this means it has twice the heat that smaller heaters tend to have. One of the very best features for this product is the fact that is has high and low temperature settings that range from 50 to 85 degrees fahrenheit. With this heating system, Mr. Heater combines PTC and Quartz infrared elements to keep you warm no matter what the temperature is outside. Using the heat distribution and the transfer rate that this product offers, when you turn it on you will immediately feel a difference in the air around you. Depending on the level of frigidity you are feeling from one day to the next, you can turn the heat down as far as it will go, or crank it way up if the air conditioning is really getting on your nerves. This Mr. Heater unit is certified by Underwriters Laboratories in the USA and Canada. Since Underwriters Laboratories is an independent organization in ensuring American worldwide safety, they are able to maintain a non-biased opinion on safety ratings. You can rest assured that these machines are quite safe and pose no immediate threat to you or your home. According to the National Fire Protection Association, between 2009 and 2013 on average, space heaters accounted for about 40% of home heating fires and 84% of home heating fire deaths. However, due to their incredible standards and safety regulations, you will be safe from fire hazard situations. In regards to other safety concerns, this heater is also perfectly safe around children and pets. The unit itself only feels warm to the touch and cannot burn you if you are in direct contact with it. One of the great settings that comes with this heater is the energy saving auto mode as well as high and low settings when it is set on auto. This unit will cycle itself on and off as well as switch between high and low temperature settings to maintain the desired temperature setting you choose. This is great if you tend to be forgetful or don’t want to have to worry about remembering to turn things on and off. In addition to this, it will save on energy cost since it reminds itself to turn off when it is not being used. Mr. Heater comes with a three year warranty if for any reason you are not satisfied with the machine. Simply return it for a full refund or replacement if you feel that it did not meet your expectations. One of the most notable features of this model is the quiet fan. As opposed to the space heaters of the past that you could hear from a different room, you will barely be able to hear this one even if you are right next to it. This is because of the ball bearing high-pressure low noise blower is only set at 39 decibels. This is significantly lower than many other models. This Mr. Heater model is available on Amazon.com for $99.99, $138.93 for a combo pack or $128.00 for the space heater with a humidifier. These models are clad in a wooden grain build with a black from panel. Second on our list is the Lifesmart infrared heater. All infrared heaters have many different cost and health benefits, but as seen before, each model is different. This Lifesmart option will provide you a cozy warmth that is considerably cheaper and more efficient to use than other varieties of space heaters. With the new safety features available in most infrared heaters, these are much safer to use around children and pets. With a lifetime washable air filter, this infrared heater can filter your air all while heating it at the exact same time. Some other heater brands will also come with a filter, but will require that you purchase replacements for the filter every so often. However, with this model there is washable air filter you can reuse multiple times. If you believe that the air filter is damaged or is no longer doing exactly what it is supposed to do, you can contact Lifesmart and since it is under a lifetime warranty, they will send you a brand new one as soon as possible free of charge. Surrounded by a stylish metal cabinet as opposed to the brushed wood that was shown on the previous model, this space heater is cool to the touch which is one of the many reasons it is completely safe to use around children and pets in your hold. Along with the ease of use of this model there are EZ glide caster that make the product simple and easy to move around your home. The entire machine in itself is not very difficult to move, but it does weigh approximately 26 ponds. If you are uncomfortable carrying this weight, they EZ Glide castors will keep to make sure you can move this where you would like it to go. According to Heavy.com, these Lifesmart heaters are the top heaters to own. According to house testing by the company, these heaters are 38% more efficient than forced air electric heaters. Forced air systems are single heating units that are controlled by a single thermostat that will supply heat throughout the entire house by fan-forced air. These are most commonly found in whole homes and apartments. When the forced air systems generate enough heat through high resistance wires called heating elements, the electricity flowing through them is distributed all over your home with a fan or blower. These little heaters will pack quite a punch and are able to heat a large room even better than your traditional home heating system can. 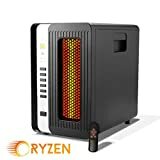 It can also cut down significantly on your heating bills during the winter months if you use this space heater, as it only uses 1500 watts of electricity. This is comparable to using a common hair dryer. In addition to their tests on forced air electric heaters, it was found that these space heaters are also about 66% more efficient than propane and 45% more efficient than electric baseboard. On this specific model, there are 3 energy savings settings that include an eco-setting to heat smaller areas using only 500 watts. This means that while this machine holds the potential to heat up larger spaces, it can be used for smaller spaces as well without causing the temperature to get too hot. The Eco setting can also help to conserve electricity when there is nobody around to appreciate its warmth. 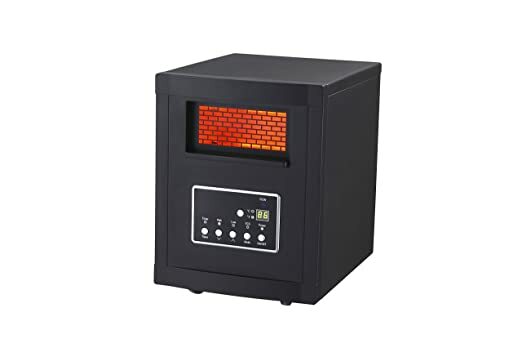 Overall this is a great little space heater that can warm variety of different rooms in your home. With a one year component warranty you can contact Lifesmart to get a replacement for whatever you feel is causing issues on the machine. In addition to the qualities listed in this review, there is a digital thermostat control so you can switch between the three level settings on the space heater. Available on Amazon for $89.99, this model also includes a remote control to change the settings and the heat temperate so you don’t have to constantly get up and can change it across the room. The next contender in this review is the Global Air heater with remote. This very first notable feature with this option is its incredibly high reviews on Amazon. Rated a total of 4.4 out of 5 stars, this machine is guaranteed to please and keep you warm all year long. Like the model prior, this also includes a wireless remote so you can control the temperature of your room with a single touch of a button all the way across the room. The dual heating system featured on this item draws about 1500 watts from the wall, which again is comparable to using a hair dryer. In the grand scheme of things, this is an incredibly low amount of wattage for an equally as incredible machine to keep you warm. With a variety of temperature settings to set the room exactly to your liking, you are able to choose your ideal temperature anywhere between 50 degrees and 85 degrees. Or, if you aren’t preferential to a specific temperature, you can just choose between low and high temperatures as well. With a high, medium and low heat setting, you can choose how hot you want your area to be. Remember to keep in mind how large your room is that you want to heat. The smaller your room, the hotter it will get more quickly than if it was a large room. You can still choose between a variety of settings no matter how big your space is though. This little heater is able to warm up spaces up to 1,000 square feet very quickly. While it may be small, it is still quite fierce. Since it is created with infrared quartz, it can lead to a much longer life of the heater. When the machine is turned on, the infrared heating elements of the quartz are able to rapidly heat the tubular lamps to produce the heat wavelengths. Since it contains quartz in the material, it is also a bit lighter compared to some other heaters. Overall, portable space heaters tend to weigh approximately 20+ pounds depending on the make and model. However this unit in particular only weighs 13 pounds in total. This would be a great heater to take with you to work when the air conditioning is way too cold, or if you decide to go camping and just need a little extra warmth at night. Featuring a high output scroll fan, it can not only provide more heat in less time, but it can also heat spaces in a much more even fashion. This means that instead of pockets where it is quite hot, and other pockets that are still freezing cold, you’ll get a more uniform distribution throughout the room. Heat tends to rise, which gives space heaters the problem of warming up the air above us and still keeping our feet cold. The high output fan is continually working to push the heat back down so both the air above and below us receive the same amount of heat. Don’t worry about leaving this heater on and walking away, with a 12 hour on/off timer, you can set it and forget it. This is also a wonderful idea for those who want to keep this machine on when they sleep. You won’t have to wake up in the middle of the night to turn it off from fear that it may be a fire hazard. As mentioned before, there is also a wireless remote so you can have the ability to control the temperature from afar. In addition to this wonderful option, there is an Eco Setting that will heat smaller areas of your home to 68 degrees using only 500 watts. This would be ideal for rooms that tend to be a bit chillier than the rest of the house during the winter. This product is available in a solid black color in Amazon for $59.66. The final item on this list has a bit more of a modern look than the previous options. Instead of the ancient looking wood grain that is commonly seen on some of the models. This has a sleek black design that is accented with a silver strip of controls on the side. With this infrared heat, they did their best to create something that was powerful yet efficient so as to bring the public something that was cost effective. As per the reviews, this is something they have achieved very well. With three commercial grade heating elements, it is able to produce an extremely powerful 5200 BTUs of warmth to keep you and your family cozy whenever you need it. BTUs stand for British Thermal Units which convert to approximately 550 watts. This is easily the most efficient and effective heater as it uses only one third of what other heaters have used so far. In comparison, the average egg cooker will use approximately 550 watts of power as well. This unit does have an air filter to remove air borne particles that may affect allergies or sinus issues. However, with this filter in particular, it never needs to be replaced, and can be removed and cleaned under warm water without any issues. One of the best features about this air filter is that it is covered by a lifetime warranty. This means that if for whatever reason you think the filter is deteriorating or is not filtering as much as it should, simply contact Amazon and they will ship you a brand new one free of charge. Safe around children and pets, the outside of the heater is cool to the touch and will never burn you. No more accidental burns to your foot or being concerned about the safety of your children and pets around the heater. Interestingly enough, if this does get tipped over by an overexcited dog or tippy toddler, it can sense that the unit was tipped and will automatically turn itself off to prevent fire hazards. With a timer and triple heating system that comes with the unit, it has an eco-energy switch that will once again use one third less energy once the room reaches its desired temperature. For even more safety, it is approved by two different United States rating agencies that ensure the highest safety standards possible. Quiet enough to barely even tell that it’s on, this unit is sure to keep you warm and cozy during the winter months. Also, this includes a remote so you don’t have to get up to adjust its setting. The Ryzen H-5000 is available on Amazon for $59.95. How big of a space do you want to heat? While for the most part these space heaters can be set to a specific temperature that is ideal for a variety of different spaces, you want to keep in mind what space you will be using this to heat consistently. When purchasing an item like this, have an idea of where you want to place it in your home or apartment so you can get exactly what you need. Or, if you plan on using it in a variety of different spaces, look for something adjustable. Do you tend to be environmentally conscious? Eco smart sensors are not only great for your own safety, but they are a wonderful option for those who are environmentally conscious and want to contribute to the care of the environment while also staying warm. Many of the models above have options such as a timer to turn the heat down or completely off once you reach your desired temperature, or when the timer expires. If this is something you are interested in, keep this in mind as there are options above for you. If you plan on keeping this in one spot in your bedroom, how heavy the unit is isn’t too much of a concern for you. However, if your plan is to bring it with you when you are camping or put it in a trailer, the weight of the item is very important to keep in mind. The options above have their weights listed so you can easily make the decision about your preferences. Do you really like to hang out on your couch? Picture this. You just got home from a long day of work and the weather outside is absolutely terrible. It’s the type of snow where everything is wet and slushy, but you’re also ridiculously cold and frozen. You get inside under a warm blanket and turn on your space heater to thaw yourself. Once the room gets hot enough, you want to turn it off, but you don’t want to get out from under your blanket. You’re in luck because you purchased the heater that comes with a remote so you don’t have to! If this sounds anything like you then don’t worry, more than one of the options above have wireless remotes. Your own preferences are the most important part of any decision, and based on the pre-purchase considerations here, you can choose whatever model suits your exact needs and remain cozy and comfortable knowing that whatever you decide will keep you warm all year long.